I don’t know who originally created this image, or what their purpose was – but I feel it’s a really good illustration of what life can be like for people with ME – or indeed for anyone with a chronic illness. The negative aspect of the image is obvious: being weighed down, held back, prevented from ‘flying’. Those of us with ME often quite literally feel like we are weighed down, as if we have rocks tied to us and/or have our own extra-strength gravity field, making it so hard to move muscles, limbs, etc. However, I think there is a lot of positive in this image, too – and it’s this positive aspect that I want to concentrate on. Look how beautiful and vibrant the butterfly is. 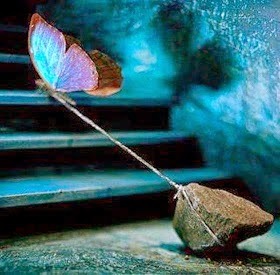 Notice that the rope tethering the butterfly to the rock is taut, not slack – the butterfly hasn’t given up fighting, it’s still striving for life. Those of us with ME and other severe chronic illnesses may be sidelined from life, we may be housebound, we may not be able to work or offer what most people think of as a valid contribution to society – but we still have value. 1. You are not alone, you are not the only one. There are huge communities of people online; reach out to them. There are people out there who understand what you’re going through. 2. However many things you can’t do, and however many friends you’ve lost due to your illness, you are still important and precious and valuable, because you are YOU. 3. Don’t give up. Hang in there. Keep going. I KNOW it’s not easy, but don’t stop fighting. 1. They are still a person, they still have value, they still have gifts and talents. 2. They may have to ‘do’ friendship in a different, more limited way than before – but that doesn’t mean they’re not worth the effort. But please do respect their boundaries and limitations! 3. Just because they may have had to withdraw from life as they previously knew it, doesn’t mean they’ve ‘given in’ to the illness or given up on life; it just means they have no choice but to take care of their health. By taking proper care of themselves, they ARE fighting, and they are strong. They may seem weak to you, but it takes more strength than you can imagine, just for them to keep going each day. 4. They need your encouragement and support to help them to keep fighting. And you taking time to find out more about their condition, and what you should/shouldn’t do, will be a great help to them. 5. If you are one of the special people who has stuck by your ill friend/family member and tried to support them, THANK YOU (times a million). So many people refuse to even try to understand, and/or just disappear from the lives of ill people. Never underestimate the difference you are making or how valued you are. But caring for/supporting someone who is ill is very, very hard, so look after yourself too; you are no use to the person who is ill (or anyone else for that matter!) if you get overburdened and burnt out. So don’t forget: we may be tethered, but we’re still butterflies, and our lives still have beauty and purpose and meaning. Thanks for your post Rachel! If anyone else would like to contribute please send me a comment or email – I would love to hear from you!